UBC13 antibody recognizes ubiquitin-conjugating enzyme E2 N, also known as bendless-like ubiquitin-conjugating enzyme, UBC13, UBCH13, ubiquitin carrier protein N or ubiquitin-protein ligase N. The antibody has been extensively validated for western blotting using whole cell lysates. Rabbit anti Human UBC13 antibody recognizes UBC13, also known as ubiquitin-conjugating enzyme E2 N (UBE2N), an important component of the toll-like receptor and interleukin-1R signalling pathway. UBC13 is a DNA-damage inducible protein which forms part of an enzyme complex, with UEV1A, that indirectly activates TAK1 via the ubiquitination of TRAF-6. Ubiquitin modification of proteins is important for error-free DNA repair and for targeting of short-lived or abnormal proteins for degradation (Martein et al. 2009). 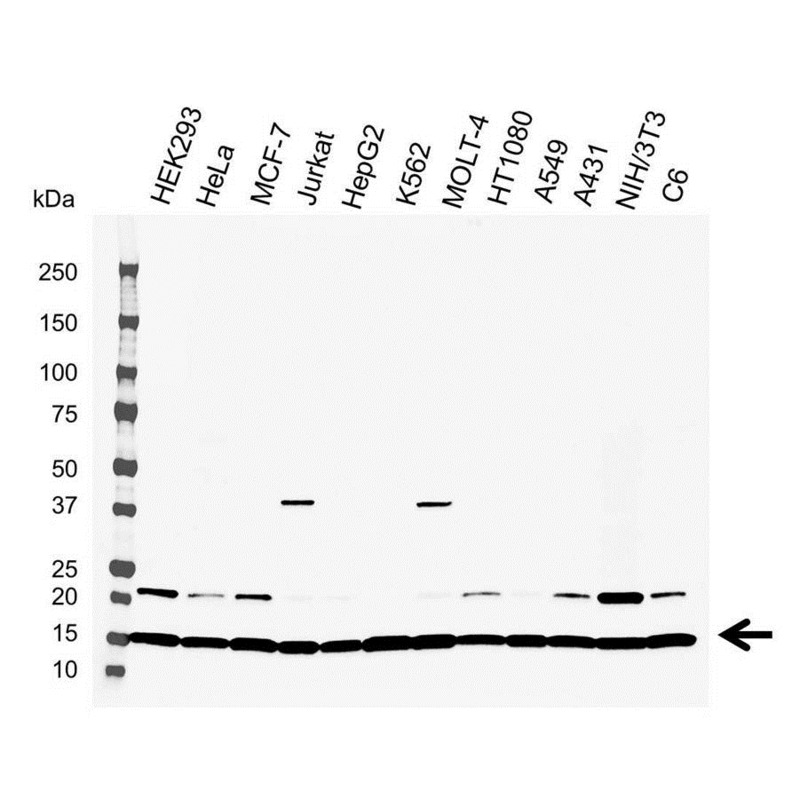 Rabbit anti Human UBC13 antibody detects ubiquitin-conjugating enzyme E2 N as a band of 17 kDa in a wide range of human cell line lysates. Cross reactivity with rodent cell lines is also observed. Rabbit anti UBC13 detects a band of approximately 17 kDa in K562 cell lysates. A 15 amino acid peptide located near the human UBC13 C-terminus.